CASTRIES, Apr 12 2019 – Jua Kali is a social enterprise tackling waste management and helping to reduce reliance on St. Lucia’s only landfill, which will reach the end of its lifespan in 2023. The company, with its slogan ‘Trashing the Idea of Waste,’ hosts waste collection drives through pop up depots that encourage residents to bring in glass, plastic and tin cans in exchange for supermarket shopping points. This is happening as St. Lucia, like other small island states, faces climate resilience issues with freshwater quality and deterioration in marine and coastal ecosystems. Jua Kali is the brainchild of Laurah John. She talks to IPS about why she established Jua Kali and the challenges that she has faced on the project. Inter Press Service (IPS): Tell me about your background. Laurah John (LJ): I am a purpose driven, creative rebel and sustainability change agent or at the very least I try to embody those traits through my work with Jua Kali Ltd. – a profit-for-purpose, social enterprise that seeks to provide innovative and sustainable resource recovery solutions to address waste management issues in Small Island Developing States through strategic partnerships. Before Jua Kali, I was a Social Development Practitioner/Short-term Consultant for the World Bank and Caribbean Local Economic Development project. I was also employed with the Ministry of Social Transformation. IPS: What led you to establish Jua Kali Ltd.? LJ: In 2012, I completed a Master’s in Urban Studies from the Simon Fraser University in British Columbia, Canada. 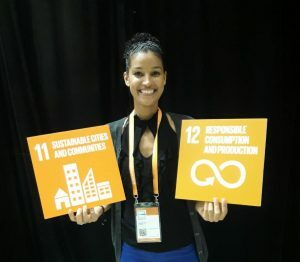 My master’s thesis, “Wasted Lives: Determining the Feasibility of Establishing a Test Case Resource Recovery Programme in the Urban Poor Community of Faux-a-Chaud, Saint Lucia” sought to explore Resource Recovery as a tool for alleviating urban poverty, enhancing environmental sustainability and bettering communities. This research formed the basis of a business idea that led me and an eight person team to win the 8th [United Nations Educational, Scientific and Cultural Organisation] UNESCO Youth Forum Startup Weekend in 2013 and led to the creation of Jua Kali Ltd. in August 2014. IPS: Tell me about your slogan, ‘Trashing the Idea of Waste’. LJ: We acknowledge waste as a design flaw in how we built our societies and do not see it as acceptable. We are challenging the public to re-think the concept of waste and question consumption patterns and how that contributes to the problem. We are empowering consumers to recognise that they have the right to leverage (their dollar) and demand that producers create better quality products that address the end-of-life reality of their goods. Producers take limited resources to create goods that are bought then thrown out. If we no longer believe that waste is acceptable, it means that this product, once utilised, needs to feed into some other process for continuity – closing the loop! IPS: How do you host collection drives and are you satisfied with public reception? LJ: The collection drives are based on the Pop Up shop concept – hence the name Pop Up depots – where we set up shop with our tents, tables, chairs and army of volunteers, to create an area where the public may drop-off used household materials like plastic bottles and containers, glass jars and bottles, as well as cans and tins. In return, they receive points on their Massy Stores Loyalty Card. We set up twice a month. We are very satisfied with the public’s reception! From our very first day back with the depots (Mar. 2, 2019), many people came up to us to say how happy they were that the depots had resumed, what a great initiative it is, and that they hoped it was coming back for good – encouraging words that reinforced that we are on the right path. IPS: What are some of the challenges you face in this project? LJ: Raising awareness is our biggest challenge. Airtime is expensive and although we have some sponsorship in this regard, much more is required to have a consistent presence to remind the public of the depots. Additionally, where people receive their information changes depending on what part of the island they reside. This requires a communications strategy that is both robust and multidimensional, pulling on a variety of platforms to target different audiences. IPS: Where do you see Jua Kali in 5 years? LJ: As a regional leader in socio-environmental stewardship. IPS: Why is waste diversion and reduction so crucial to the climate change and environmental discussion? LJ: To appreciate the importance of waste diversion and reduction activities and their contribution to the climate change and environmental discussion, we must first understand the severity of their impact. Typical disposal and treatment of waste in a landfill can produce emissions of several greenhouse gases (GHGs), most significantly methane, which contributes to global climate change. Other forms of waste disposal also produce GHGs though mainly in the form of carbon dioxide. Additionally, improper waste disposal can create or exacerbate disasters, for example, by clogging waterways leading to flash flooding and creating hazardous public health conditions by contaminating water sources, creating breeding grounds for disease borne vectors such as mosquitoes. Furthermore, on a small island like Saint Lucia with a limited landmass, sending our trash to a landfill takes up valuable productive land. There has to be a better way! IPS: Do you think the Caribbean is giving sustainable waste diversion and reduction due attention? LJ: More and more, Caribbean countries are giving attention to the waste issue, primarily because of how visible it has become with the increased use of plastics, the international campaign against plastic pollution and the detrimental impact this can have on tourism based economies. There is also a growing awareness and research to highlight the negative impact of waste on water quality and fisheries. As such, this is driving action towards supporting initiatives like ours. Could it use more attention? Definitely, but we are making headway.